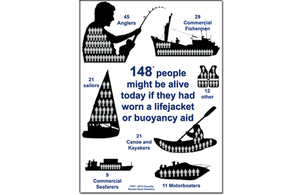 Twelve people’s lives might have been saved in 2013 if they had been wearing a lifejacket or buoyancy aid. The number of people who died without a lifejacket/buoyancy aid, who may have lived if they had worn one, has been decreasing since 2007. The panel has suggested that increasing awareness of the benefits of buoyancy aid and lifejacket wear may have helped to reduce the numbers of lives lost over the last few years. The Casualty Review Panel meets once a year to discuss the circumstances surrounding fatal maritime incidents. It provides its opinion about whether a lifejacket or buoyancy aid might have saved a person’s life. This year the panel commented that other safety measures, in addition to buoyancy wear, are important in ensuring safety. These include carrying a means of raising an alarm, getting trained, knowing how to call for help, being suitably dressed, being aware of public rescue equipment at certain locations and checking weather conditions and tides. These figures and the accompanying text cover all personal flotation devices including lifejackets and buoyancy aids. These figures have been compiled by an expert panel review comprising: Angling Trust, RNLI, Royal Yachting Association, Marine Accident Investigation Branch, Maritime and Coastguard Agency, National Water Safety Forum, British Canoe Union, the lifejacket industry, Scottish Fishermen’s Federation and University of Portsmouth. The panel uses data supplied from Coastguard and MAIB databases and therefore covers mostly coastal incidents. Other inland fatal angling incidents, where a lifejacket might have saved a life may have occurred during 2013 but these are not included for this exercise. Outside these hours, for emergency press enquiries only please dial the above number. You will hear a message giving details of how to contact the on call press officer.